Quick preparation and hands-free slow cooker cooking make these soups perfect for busy days and everyday lunches and dinners. Here are some of the most popular soups, including creamy chowders, vegetable soups, and meaty main dish soups. This is a great soup to make for a party or tailgating. Garnish with fried corn tortilla strips or crumbled tortilla chips. Whole grain sorghum is an excellent substitute for rice or barley, and it's gluten-free. It retains its shape nicely and adds texture to the soup. Andouille sausage adds great flavor and some heat to the peas. Use a less spicy smoked sausage or chorizo in the soup if you'd like. This is a hearty and versatile soup, and can easily be made low carb by eliminating rice or pasta and beans. You could add extra ground beef and vegetables to the mixture. Enchilada sauce, tomatoes, peppers, and a variety of vegetables flavor this fabulous chicken soup. Chicken thighs and beans provide the protein in the soup along with shredded spicy cheese. Cook this delicious soup in your slow cooker or Instant Pot pressure cooker. Condensed soups team up with vegetables, herbs, and noodles for a creamy soup with convenient ingredients. This clam chowder is lighter than the New England creamy clam chowder, and the flavor is amazing. For a smooth soup, puree the finished soup in the blender and then add the milk and butter. Garnish this tasty broccoli soup with croutons or shredded cheese. This classic combination of chicken and corn is flavored with some red bell pepper and mild chile peppers. Top this popular chicken tortilla soup with crispy tortilla chips, extra shredded cheese, and some fresh chopped cilantro or green onions. This versatile 15- or 16-bean soup can be made with Italian sausage, ground beef, or a spicy chorizo. Herbs, diced vegetables, and garlic are among the flavor ingredients along with the bean soup mix. Bacon or salt pork flavor this creamy clam chowder. Make it richer with half-and-half or light cream. This easy potato soup is made richer with cream cheese or Boursin with herbs. 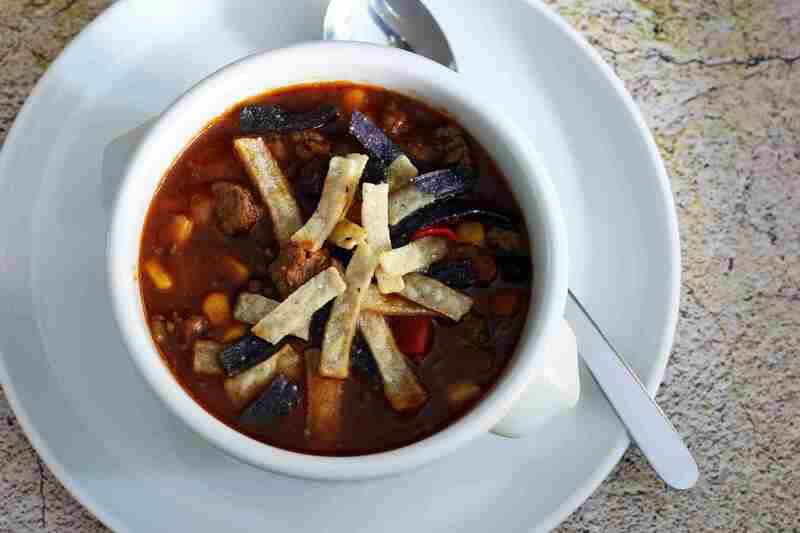 The chorizo and corn make this potato soup flavorful and slightly spicy. Use Italian sausage in the soup if you prefer a milder flavor. Use leftover diced ham or country ham in this flavorful lentil soup. A leftover corned beef and cabbage dinner is transformed into a fabulous soup with this easy crockpot chowder recipe. Dry navy beans, ham hocks or a ham bone, and a variety of vegetables and seasonings get together to make this hearty and flavorful bean soup. Kielbasa and cabbage team up in this tasty, full-meal soup. Serve the soup with crusty bread or rolls. Cook this hearty black-eyed pea soup in the slow cooker or on the stovetop. This vegetable soup is full of flavor and it's easily made vegetarian with vegetable broth instead of the condensed French onion soup. Vegetables include carrots, spinach or chard, zucchini, and cabbage. A variety of dried or fresh herbs and peppers flavor the soup, along with garlic and onions. This soup will quickly become a family favorite. Use frozen grilled burgers cut into small pieces. Double the soup and freeze leftovers. This hearty beef soup is the perfect soup for cooler fall and winter evenings. What's the Difference Between Consommé and Stock?